ATTRIBUTES: Smoky Quartz is one of the most efficient grounding and anchoring stones. Smoky Quartz facilitates the grounding and assimilation of spiritual information (also known as the "download.") Smoky Quartz enhances practicality and organization. Smoky Quartz is superb antidote to stress. The positive energetic vibration of Smoky quartz shields one against geopathic stress, absorbs electromagnetic energies, assisting with elimination and detoxification on all levels. Smoky Quartz assists in tolerating difficult times with equanimity, fortifying resolve. Smoky Quartz absorbs and recycles negative energies by grounding the energy back into the Earth reestablishing a healthy energy flow. Smoky Quartz aids in communication and clear thinking by purging the atmosphere of unspoken resentments or suppressed conflicts. Smoky Quartz is a “stone of cooperation.” Smoky Quartz has a strong link with the earth and the base chakras, promoting concern for the environment and ecological solutions. Smoky Quartz may be used to protect the earth chakra below the feet and create a grounding cord when in an area of disturbed earth energy. Smoky Quartz relieves fear, lifts depression, brings emotional calmness, and alleviates suicidal tendencies and ambivalence about being in incarnation. Smoky Quartz aids acceptance of the physical body and the sexual nature, enhancing virility and cleansing the base chakra so that passion can flow naturally. Smoky Quartz facilitates moving between alpha and beta states of mind and aids clearing the mind for meditation. Smoky Quartz is an excellent stone for manifestation and helps to bring one’s dreams and inspired ideas into physical reality. HEALING: Smoky Quartz is effective for ailments of the lower part of the physical body such as the abdomen, hips, and legs. Smoky Quartz benefits the reproductive system, muscle, and nerve tissue, and the heart. 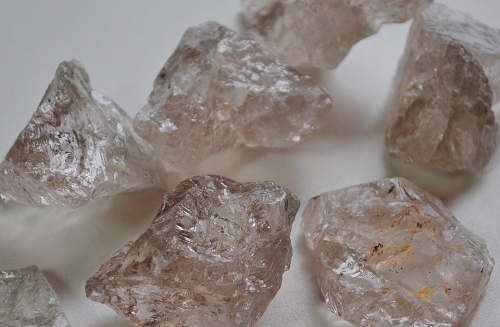 Smoky Quartz dissolves cramps, strengthens the back and fortifies the nerves. Smoky Quartz aids assimilation of minerals and regulates liquids within the body. Place a piece of Smoky Quartz on your desk or work space to protect yourself from your computer or electronic device’s electromagnetic waves. In crystal body layouts or healing grids, a crystal layout of slow-release Smoky Quartz pointing away from the body may prevent a “healing crisis” from occurring. Smoky Quartz is an excellent stone to place on the solar plexus and the chakras located at the hands and feet for Chakra healing, grounding and balancing energy. For Gaia Healing, Smoky Quartz may be placed in an area of disturbed Earth energy. The energy of Smoky Quartz combines well with other grounding stones such as Sugilite, Black Tourmaline, Jet and Obsidian.